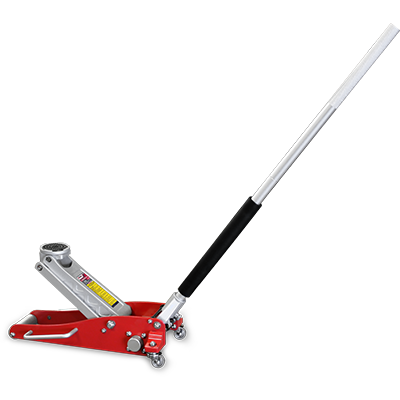 The RFJ-3000AL is a dependable, lightweight floor jack crafted out of aircraft-grade billet aluminium. Reaches full height in just four quick pumps! The Ranger model RFJ-3000AL Aluminium Quick Jack is made of the strongest aircraft alloy aluminium available. Not only does it weigh in at a feather-light 19-kg., but it gets any race car or hot rod a full ​44.5 mm off the ground in just a few pumps of its knurled aluminium handle. With a low 89 mm profile front-roller, the RFJ-3000AL is perfect for working on ground-hugging, low ground-clearance performance vehicles. We all know that race tracks are fast-paced environments. When a tyre needs to be swapped or you need to reach the undercarriage to do a little last-minute wrenching, there are two problems that come up. One, you need a jacking method that’s low-profile and will safely reach your jack points. Two, floor jacks and stands are portable, but that doesn’t mean they’re fun to lug around. This aluminium jack is as lightweight as it efficient in fast-paced or high stakes situations. It’s also ideal for home garages. Simply put, a lighter, more powerful floor jack keeps you working smarter at all times. You’ve heard a lot about how aluminium is changing the game. Aluminium trucks are light, powerful and capable of towing more weight than older steel-frame models. Likewise, aluminium floor jacks are sure to catch fire (not literally, of course) in the near future, even more than they already have. These lighter designs are safer and more ergonomic for the user, taking the hassle out of any job. The RFJ-3000AL is a revolutionary garage floor jack we know you’ll love in your shop or garage.